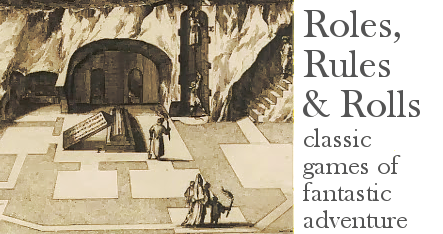 This year being the 35th anniversary of the Advanced Dungeons and Dragons Player Handbook, I thought it only fitting to remedy some of the realism gaps in mine own 52 Pages ruleset, taking a leaf (no. 38, to be precise!) from the Dean of Dungeons himself - possibly the most beloved page of all in that estimable tome. After extensive research in musty fechtbueche, after in-depth consultations with American ninjas and dead-serious dudes who will cut you if you call them "reenacters," I decided to ignore everything they told me. D&D was never supposed to simulate the literal medieval era, but rather, a mythopoetic simulacrum-dimension called "Dungeon Game Reality." 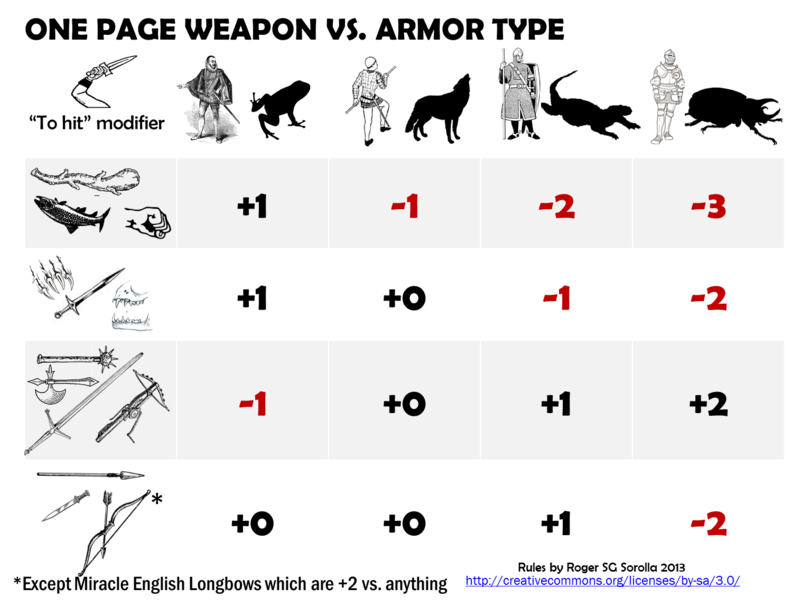 Hence, D&D is always correct - and thus, inevitably, AD&D just advances the correctness to a near-unbearable level, in a brief golden decade before the "Et tu, Brute?" of 2nd Edition. Of course, because the attention spans of today's gamers are beset with daily rat-race and squalling offspring - or else, were strangled at birth in a world of point-and-click instant gratification - the chart had to be cut down from its original 57 x 9 to a mere 4 x 4. Combat now presents a terrain of real strategic choice! Do you drop your enchanted flatchet and choke-up on your retainer's mundane awl-pike, the better to penetrate the crevices of the giant serpent's scales? From the rack of pole arms, do you grab the sword-like glaive-guisarme as the tool wherewith to Julienne that room of giant mushrooms, or trust in the axe-like power of the bardiche to dismember the killer ants foretold in yon scrawled graffito? And at last, the traditional poisson d'Avril shines forth in the arsenal of adventure, delivering a most efficacious slap to unjacketed varlets. Future Advanced 52 Pages updates include psionic combat, aerial jousting rules, that hardscrabble hero class the Monk, and Boot Hill character conversion guidelines. I read the post topic and was really excited. 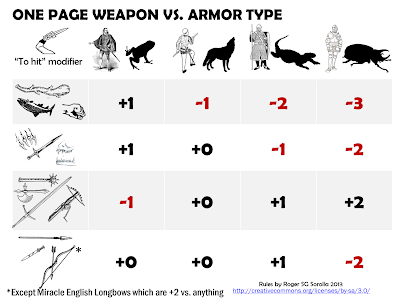 And low and behold you did produce something I would use, even as I appreciate all the rest - including the relevant note about the katana of missile weapons, the English longbow. Old School Dungeon ... Fabric? Experience Points: Is This My Final Answer? Is the Cartoon Dungeon Master Your Petty God? Does Clerical Magic Mean You Know God? Is the Dungeon Master Your Cleric's God?